To Drop the Course or Not? As the S course drop deadline of March 14th looms near, the subject of dropping a course has been on my mind. My struggles in sciences courses have been limited, thankfully, but after a difficult midterm and a lower grade than expected this year I have been considering dropping a class, even though it’s a program requirement. These feelings of wanting to drop a course are not new to me: in my first year, I took a humanities course that was intimidating since there were assignments worth as much as thirty percent each! Back then, I eventually realized that I needed to ease my transition from high school to university by dropping a course. 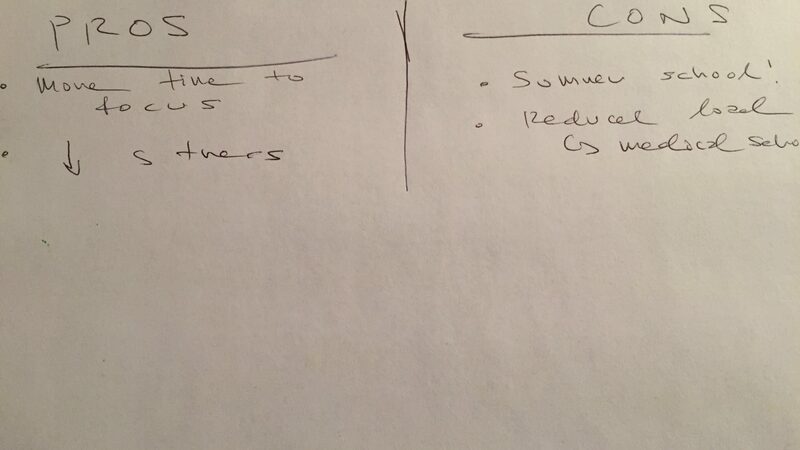 My post last week talked a bit about the pros and cons of having to make up this credit over the summer. This week’s post focuses on the act of withdrawing from a course. After leaving the course, I admit I felt like a bit of a failure. It was only the first semester of university! How could I progress through the rest of my degree? Hearing my new classmates discuss the struggles of their five courses, or even six, made me stay silent when they asked what courses I was enrolled in. I may have felt embarrassed, but the one feeling I did not have was regret! I feel that at the university, there can be a strange competition between students about who can struggle the most. Whether it’s who has slept the least in the last twenty-fours, who crammed the most for the midterm or who’s had the most coffee this week, I spent a lot of my first semester ending up in these contests. It took some time, but I realized that overcoming this competitive mindset, and realizing that struggling is not an indication of being a “better” student, allowed me to progress without regret and at my own pace. Yes, I lost those student competitions, but my reduced load helped me manage my time. Additionally, knowing my GPA and mental health would both be less likely to take a hit made the decision that much easier to accept. The University of Toronto Scarborough Campus has this handy worksheet to print off and use to determine if you should drop a course. Check out the link here: www.utsc.utoronto.ca/aacc/sites/utsc.utoronto.ca.aacc/files/tipsheets/Academic_Advising_Tipsheets/ShouldIDropThisCourse.pdf. 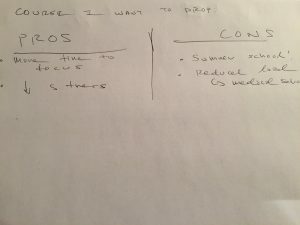 Make a pros and cons list on a piece of paper to help you rationalize your decision. If you Google “grade calculators,” you’ll be able to find a variety of free online mark calculators so you can determine what you grades you’ll need to obtain on the rest of your assignments to pass or meet a particular grade point. This is one I like: www.benegg.net/grade_calculator.html. Take a look at past tests and assignments. If you wrote an essay and you were surprised by the grade, talk to your professor about what you need to improve. Looking at your past evaluations can help you decide if your overall course grade is salvageable or not. 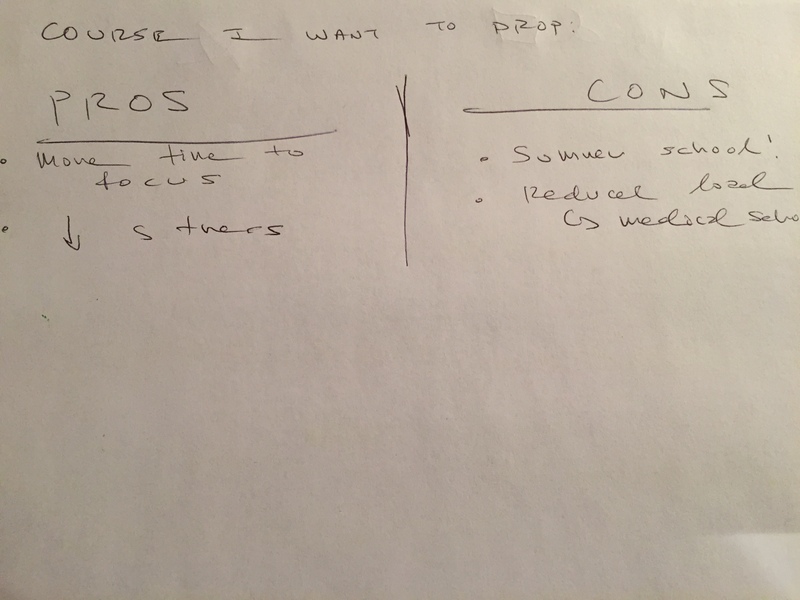 My current, developing pros and cons list. Some of my concerns include the implications of dropping a course. What implications will dropping the course have on your degree and program progression? Personally, I would ensure that the course dropped is not a prerequisite for a course you’ll need in the next academic year, especially if you need a course that isn’t offered very often. To see if the course is a prerequisite for higher year courses, I recommend going to the University of Toronto Calendar (https://fas.calendar.utoronto.ca/). From this link, you can select Course Search on the left-hand side of the screen. You can search for courses that you know you need to take or are interested in taking during the next semester. Under the Prerequisite column you can see if you need the course you dropped or intend to drop. This can take a lot of time to think through all of the possible implications, so this is one of those points where heading to your registrar can be especially valuable. They can advise you if dropping the course is a good idea or if selecting a CR/NCR is a better bet. In case you don’t know the acronym, CR/NCR means “credit/no credit,” and courses done like this are just on a pass or fail basis—but they count as credits if you pass, meaning you can avoid a potential 6-credit semester. In terms of some of the bureaucracy involved, I want to note two things. First, I should mention Degree Explorer (degreeexplorer.utoronto.ca), just in case. It’s a great website to track your progress through your current program and degree. Second, it’s sometimes necessary to remember that financial aid can be impacted by a reduced course load. You can discuss this with your registrar too, and/or visit Enrolment Services at 172 St. George Street, across from the St. George subway station. This website, www.future.utoronto.ca/faq/how-do-i-contact-enrolment-services-finances, provides more details about the hours and phone number of Enrolment Services. The decision to drop a course is a personal one with no set equation. However, I am a strong believer that your mental health is the most important factor. In my first year, I knew that the additional load would harm me more than benefit me. We all progress through our degrees at different paces, and that’s nothing to be ashamed of! You have to decide what’s right for you. Have you dropped a course? If so, how did you decide it was the right choice? Leave me a comment below!